Create your wardrobe to maximise your storage space. With many different designs, we can help you create a wardrobes that will suit your everyday needs. 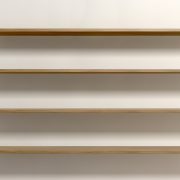 Our shelving consists of 16mm melamine custom cut to your requirements. 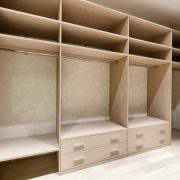 Allow for your wardrobe to be fitted with banks of drawers, shoe shelves, adjustable shelving or hanging space. Once one of our sales representatives are on site they will help discuss with you what options fit your room best. Close off your open shelving with our range of glass, mirror, or timber sliding doors. Our framework comes in a range of colours available to match or compliment other aspects of your room. Perhaps modify your shelving and upgrade to a different colour to make your bedroom stand out. You can decide which timber colour to use from our Polytec range. This will provide an elegant look to your bedroom.